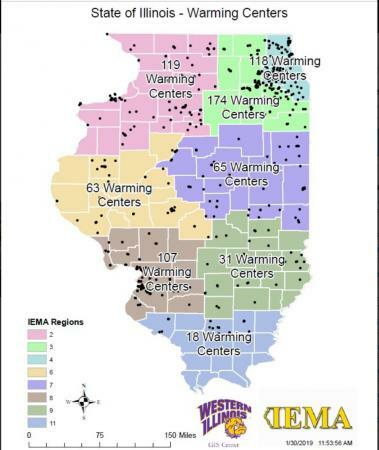 MACOMB, IL – Staff and student workers from the Western Illinois University Geographic Information Systems (GIS) Center helped create a statewide map of warming centers for Illinois residents during the recent polar vortex weather conditions. The WIU center worked closely with the Illinois Emergency Management Agency (IEMA) to complete the work. The maps and GIS layers were shared on social media by the Illinois Emergency Management Agency and liked, shared or re-tweeted by countless Illinois residents, including Governor JB Pritzker. "The weather system that moved through our state delivered record breaking, life-threatening wind chills," said Acting IEMA Director Alicia Tate-Nadeau. 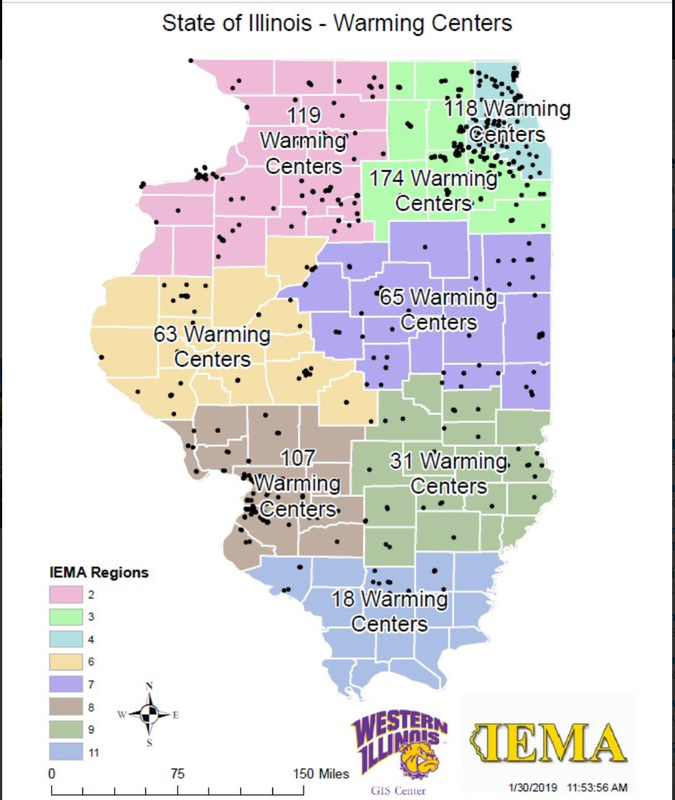 "The assistance provided by the team at Western Illinois University proved to be invaluable as the state worked to inform the public about the importance and availability of warming centers up and down our state." In cooperation with Pamela Brooks, the GIS liaison for the State Emergency Operations Center (SEOC), the WIU center was able to put into action a very preliminary plan they have been developing for less than a month with the WIU Severe Weather Club, WIU IESMA Student Organization and the Student Society of Geography. These student groups are interested in providing GIS assistance to area emergency response agencies in the event the need arises. "The Polar Vortex of 2019 gave us an opportunity to jump in before protocols had been established," said GIS Center Director Chad Sperry. He added that WIU students Jack Walberg, a senior network technologies major, GIS minor, of Ottawa, IL, and Adam Fackler, a senior law enforcement and justice administration major, GIS minor, of Lake Zurich, IL, collected data for the map from a variety of sources. "Jack and Adam continue to go above and beyond when they have an opportunity to apply their skills and to help," said Sperry. "When provided an opportunity to help, they both volunteered their time on a day that WIU was shut down due to the cold to make sure IEMA could receive the support they needed." Additional student assistance for the project came from Ian Stearns, a sophomore meteorology major, of Springfield, IL; Jason Wiegand, a junior GIS major, of Jacksonville, IL; and Nate Stowell, a freshman meteorology major, of Bancroft, MI. Supervision was provided by GIS Center staff members WIU GIS specialists Renée Büker and Keisuke Nozaki. Büker and Nozaki managed the request for mapping help and ensured it was completed on time. For more information on the GIS Center at WIU, visit wiu.edu/GIS.